While contemplating truth, along with the manner it is held, an important consideration is humility. Understanding an unmovable conviction regarding truth can be expressly humble. Today however, humility is defined in a manner befitting of one descriptor—arrogant. GK Chesterton gives a superb explanation of such humility. Let’s not confuse the confounded-humility of today. The humility of man today has an insipid lack of genuine meekness and modesty. Man’s intellectual ability to doubt everything is elevated to the level of divine reason. Humility, right ordered, where one thinks less of themselves than they ought, will produce a healthy doubt in their own abilities; all while producing a healthy conviction of the things of God. Humility regarding the truth is not a doubting of the truth, and trusting in ones own ability to determine such truths, rather it is rightly grasping who we are while trusting in God. We can walk in genuine humility holding firmly to truth and faith in the Lord Jesus Christ. Tags: followers of christ, Jesus, Pastor's Corner, Truth, What is Truth? What is truth? Well, truth is proclaimed, it is followed, it is argued about, it is disbelieved, and it is often forgotten. Truth is factual information. Yet it is so much more than just information, it is the real and accurate descriptor of life. Life is oft described philosophically, while truth is more than a mere philosophical abstraction. Truth operates in reality, as reality, and not as the fanciful imaginings of the human intellect. Even so, not everyone seeks the truth. A plague on human existent since the deception in the garden. And not all agree upon the nature of truth—yet another blight on human existence. 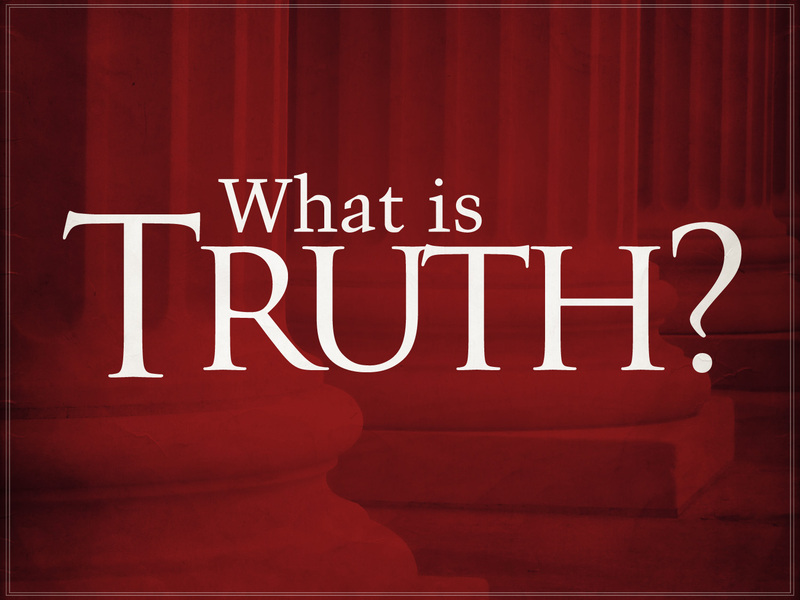 Even in John 18:38 Pilate asked Jesus this very question, “what is truth?” Demonstrating the conflicting ideas regarding truth. I know, it seems a little too philosophical, nevertheless, as believers in and followers of Jesus Christ we must be be concerned with truth. Why? Because Jesus is the Truth. Jesus is the very essence of reality. He is the one who created everything. He is the one who upholds everything. If we are not thinking about the truth then we are not thinking about Jesus. Now, this is not a call to dig into old school books and think upon measly information. Nor is it a call to intellectual hardheadedness or philosophic snobbery. Rather, we must dwell upon truth, fixing our minds on Jesus Christ. Jesus is the way the truth and the life. If we want to know truth we must know Jesus. If we want to know Jesus we must know the truth. Followers of Christ are sanctified in truth, and as His Word is truth. Imperative for those in Christ is to meditating upon the truth found in the Word. Truth about ourselves, truth about the condition of man, truth about God, truth about reality; these truths about humanity are founded in Jesus. This isn’t a call to some esoteric exercise for the super spiritual, but a simple plea to seek The Truth. So what? What’s the point? The point is this — Followers of Christ walk in light of God’s Word. A Christian’s life must stand in concert with the truth of God’s Word, and with The Truth who is God. If the concern for truth only extends as far as our own personal eternity, a warmed over version of the American Dream, without a regard for the destiny of others, then we need examine our self and see if we are in the faith. If our concern for the truth exists in regard to being right, while proving others wrong, then we need to examine our faith. Finally, if our concern for truth is content to allow others to wallow in their error, while fatalistically claiming God will work it all out in the end, then we need to learn by faith to speak the truth in love.